Often times I have a patient that says that statement, and it is accompanied by a windmill movement of his or her arm. I always think of what my mother would say when I did the same thing as a kid: “If you don’t like the clicking then stop doing that!” But the answer is not so simple. Clicking and other noises in the shoulder are common complaints from the patients I see. The noise can be associated with a sensation of grinding or it can occur on its own. Is it a sign that something is wrong? Is there a tear? Will this require surgery? One study showed that clicking is present in 1 of every 3 people who are pain-free, and experts consistently agree that non-painful clicking is almost always a result of pressure changes within the joint. This means that if the click doesn’t cause you pain, then you likely don’t have to worry about it. Why does the shoulder click? You can experience a “click,” “pop,” or “clunk” at any of these joints. The “ball and socket” part of the shoulder joint (glenohumeral joint) more closely resembles a “golf ball and tee.” The part that holds the ball is actually much smaller than the ball itself. This creates an inherently unstable joint, and therefore it needs the reinforcement of the joint capsule, labrum, and the rotator cuff muscles to function properly. The joint capsule is a series of ligaments that connect bone to bone to provide passive stability. The rotator cuff provides dynamic stability because it is a group of 4 smaller muscles that contract together with movement and at rest. Let’s say you are stretching out before getting out of bed in the morning… sometimes the joints make noise as you move. The noise you are hearing is called a cavitation, and gas is being released from the joint. The noise should dissipate after a few of the same movements. If you are doing an exercise at the gym and your shoulder pops with each and every repetition, this may be caused by a tight muscle and can be relieved with stretching. Painful clicking of the shoulder is usually pathological. Painful clicking can be caused by excessive mobility of any of the 4 shoulder joints, a partial or full tear in the muscles or ligaments supporting the shoulder, osteoarthritis and rheumatoid arthritis. Painful clicking does not necessarily mean that you will need surgery. Often anti-inflammatories, physiotherapy, rest, or a combination of those three can treat the painful clicking successfully. Causes of clicking can usually be predicted by a patient’s age. If someone under the age of 30 has painful clicking in the shoulder, I am most likely to think it is a result of loose ligaments (may or may not be associated with trauma) that are causing excessive motion. This is usually the case in young athletes involved in contact sports. 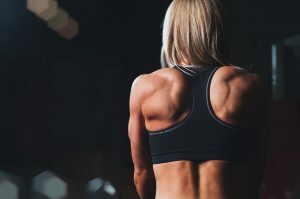 A second likely scenario is a tear in the labrum, which is a cartilage rim around the “socket” part of the joint, and its purpose is to improve stability. If someone over the age of 55 comes to me with painful clicking in his shoulder, he is most likely suffering from degenerative changes in the joint, and the cartilage no longer protects the bone from friction. 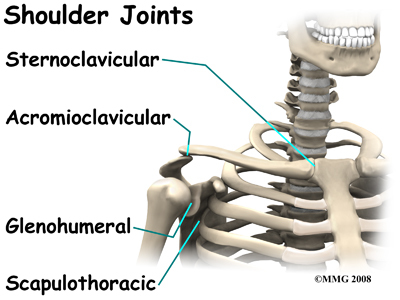 The most common parts of the shoulder for this to occur are the glenohumeral joint and acromioclavicular joint. This is treated conservatively first (a combination of physiotherapy, relative rest, and injection) and if conservative treatment fails, surgery is a consideration. If your shoulder is popping and there is no pain associated with the pop, you are likely in the clear when it comes to injury. If the sensation of the popping bothers you, try some stretching, scapular stability exercises and core strengthening. If your shoulder is popping and there is pain, consult a physician, physiotherapist or chiropractor. He or she will likely recommend conservative treatment, but further diagnostic testing can be done if the treatment does not help. Shoulder clicks, clunks, and pops. ShoulderDoc Website. Available at: https://www.shoulderdoc.co.uk/article/1525. Accessed September 6, 2016. Funk L. Painful clicking, snapping and popping of the shoulder. ShoulderDoc Website. Available at: https://www.shoulderdoc.co.uk/article/1624. Accessed September 12, 2016. Questions and answers about shoulder problems. National Institute of Arthritis and Musculoskeletal and Skin Diseases Website. Available at: http://www.niams.nih.gov/health_info/shoulder_problems/#infor_1. Accessed September 10, 2016. Funk L. Treatment of glenohumeral instability in rugby players. Knee Surg Sports Traumatol Arthrosc. 2016:24:430-439. Conduah AH, Baker CL, Baker CL. Clinical management of scapulothoracic bursitis and the snapping scapula. Sports Health. 2010;2:147-155. I have had “pop” noise in my left shoulder since past 5 years.i have also consulted more than 7 specialists,but am far from cure. If made voluntarily it can reach to 300 pops a day.it never gave me pain or ache.but since the past 2 years the same thing is starting in every joint of my body.A severe movement and i feel friction in my joints. Would be thankful if i find help here. I’m 12 years old had have had a pooping/grinding noice from my shoulders when I move them back, like you… I have had this for 2 years and no one cares…. Have you found treatment yet? If you search the internet you will find a lot of different treatments against Shoulder complaints. Personally I found it a bit of confusing to find out what treatment works best. I have read a lot of positive reviews on the use of a dietary supplement containing Palmitoylethanolamide, also known as PEA. 2 months ago I started using PeaPlex and I must say it has a positive effect on my well-being. I have had this problem all my life and half the time it hurts. I have seen no doctors because I’m 11 and at first I thought I was just double jointed since I am extremely flexible and can do it just by turning my arm. Even though I stretch my shoulders a lot the popping does not go away. I just now became intrigued when I turned my arm and it popped. I read your entire article about it and none of it explains what my arms can do. Thankyou for blogging about shoulder popping. This is interesting to me as a massage therapist. I remember years ago when my right shoulder made that popping clicking noise. It wasn’t painful so I never got it Checked out. Funny thing I realized I have it no more ?